Cowards watch motion pictures for entertainment. They gather in movie houses to sit in the dark comfortably next to like-minded strangers, who share the same greedy desire to escape the harsh realities of existence and eschew experiences of higher art. Oh, then, the infinite pleasures aroused in the brave, when the lights go down, and for two hours and four minutes the mind is fed with unparalleled divine decadence! Out of black, a fractured universe would appear to awaken, devoid of color, where images are distorted, and bearings are lost, in a swirling mass of slow motion intermittent blurs. The din of anticipatory crowd walla and clanking glass precedes but melds with the horns and the drum snare of a band, whose notes prepare for an unknown chorus. Muted and jumbled colors seep into the virtually static picture, enlivening what increasingly comes into focus as a smudged living version of a painting by Henri de Toulouse-Lautrec childishly neglected time to dry. A streak of vibrant red materializes low in the contorted mass—a woman (Yes! That is a woman in a hat passing a man in black tie! )—bleeding across what portends the most contorted funhouse mirror imaginable in or out of dreams. A ring of white light glows nearly center frame. The setting could be a circus. Or not. Finally, an answer appears: Berlin 1931. The clue to place and time provides relief that is, in an instant, smacked by shock. Prior illusions are shattered, as a stone-faced man in thick black eyelashes and full make-up springs into frame, staring directly at the viewer. Although still gnarled, he is the starkest image yet. If this is a circus, then he is a clown from another cosmos. Unsettling at first, it is safe here. Strangers from all over the world are lured by the seduction of his androgynous guile to sit back, leave troubles outside and enter his galaxy of enchantment; however, his performance lacks the power to stop confrontation from taking center stage. Life outside encroaches. Just as the characters take refuge inside the Kit-Kat (the home of the clown-man, our Master of Ceremonies) by selfishly escaping the realities of a changing Germany in 1931 to pursue their lusts and live in a flimsy world of disillusionment, anyone watching the spectacle must face at what expense individuals and on more global level—a nation—may suffer, when reality is inhabited like a debauched theatrical event. The truth in all its grotesqueness is portrayed, when the opening sequence in the reflective theatre wall is masterfully mirrored at the story’s close. The red hustle and bustle of the woman passing across frame is replaced with searing red arm bands and black swastikas worn by an invading regime that was mocked and ignored by citizens lost in make-believe. 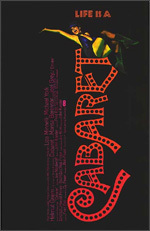 What a strange and extraordinary tale is the thought-provoker that entertains, while confronting harsh truths about troubles that cannot be left behind, no matter how jubilantly the music intones life is beautiful, the girls are beautiful and the orchestra is beautiful, in and only inside a cabaret.